Product categories of Frozen Broccoli, we are specialized manufacturers from China, Frozen Broccoli, Baked Broccoli suppliers/factory, wholesale high-quality products of Roasted Frozen Broccoli R & D and manufacturing, we have the perfect after-sales service and technical support. Look forward to your cooperation! Broccoli may help us solve our vitamin D deficiency epidemic. When large supplemental doses of vitamin D are needed to offset deficiency, ample supplies of vitamin K and vitamin A help keep our vitamin D metabolism in balance. Broccoli has an unusually strong combination of both vitamin A (in the form of beta-carotene) and vitamin K. For people faced with the need to rebuild vitamin D stores through vitamin D supplements, broccoli may be an ideal food to include in the diet. 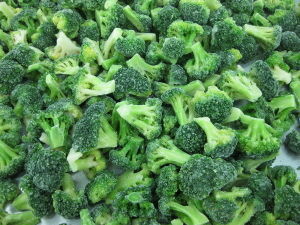 Our company can provide you with natural and healthy Frozen Broccoli.